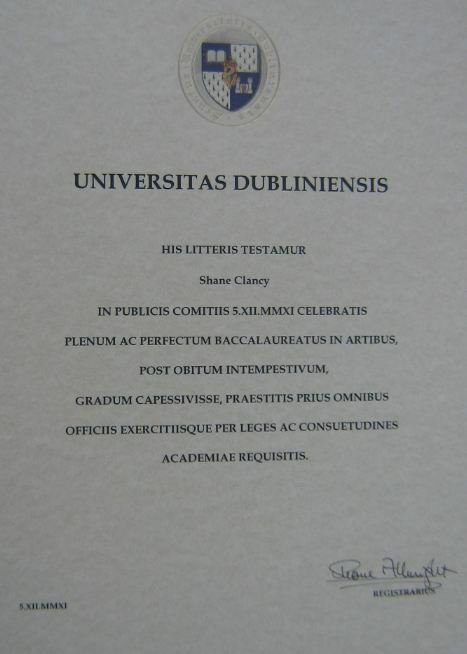 Shane’s Posthumous Degree from Trinity. Last week TCD (Trinity College Dublin) awarded Shane a posthumous Degree. It was a strange place to be when Shane wasn’t there to pick it up for himself and I must say I wasn’t really too pushed about going, but I can say I was glad I did as it turned out to be a lovely day and the staff of Trinity could not have been nicer or more welcoming. There is something about the College itself that seems to welcome all it’s visitors. Graduation day was something Shane and his friends talked and joked about a lot; who would get their degree first, who would fall over first, ect. It was really important to them all and to Shane, and I know he would have been extremely proud of himself. I would just like to say a big thank you to Dr Claire Laudet for looking after us for the day, making it a million times easier for us than it would have been. The applause that Shane received as we picked up his award was truly humbling. Also a big thank you to all of Shane’s tutors from the Irish department and the Theology department who met with us afterwards and talked about the Shane they knew and loved. It must be strange to reconcile the Shane that they knew with the events of August 2009. Thanks also to Tara and the gorgeous Aoibh who would have been there anyway with Shane, along with the rest of the crew. Rory, you’re brilliant and always a pleasure. Eimear Beemer, what can I say? Thanks. I know lots of Shane’s friends who would have loved to be there and I’m sorry that I couldn’t have invited you all but we took up way too much space as it was! The last time I was in Trinity was to hear medical author and journalist Robert Whitaker speak in the Edmund Burke Theatre about how ssri drugs are causing a worldwide epidemic of mental illness. It was also a perfect venue for his lecture as Edmund Burke is most noted for this quote “All that is necessary for the triumph of evil is that good men do nothing”. That certainly cannot be said of Robert Whitaker. Before the (Packed to capacity) lecture started, as I was a tad early, I approached him, explained who I was and asked him if I could publicly ask him the SSRI suicide/homicide question (I already knew the answer). He laughed and said I would probably get him into trouble but said yes, ask anyway! During the question and answer session I asked him about SSRI’s causing suicide and homicide; he replied that it is a well known and proven fact that these drugs can cause both and went on to cite examples and cases where the causal effect was proven. Previous postWexford suicide; what is being done? Phew…what a diffcult day it must’ve been for you..
We’re so proud of Shane!